Pancake Day Olney - Come inside to learn all about 18th century life in Olney, interpreted beautifully with Heritage Lottery funding. See our Georgian ladies and gentlemen taking in the beneficial Olney air as we promenade around the Market Place! Come inside to learn all about 18th century life on Pancake Day in Olney, interpreted beautifully with Heritage Lottery funding. See our Georgian ladies and gentlemen taking in the beneficial Olney morning air as we promenade around the Market Place! 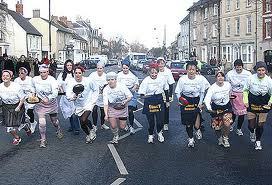 The Olney Pancake Race dates back more than five hundred years. The course is run from the Market Place to the Church at 11.55 a.m. Participants, housewives or young ladies of the town, must have lived in Olney for at least 3 months and be at least 18 years old. Wearing the traditional costume of a housewife, including a skirt, apron and head covering runners must of course carry a frying pan containing a pancake. The winner is greeted by the verger with the traditional kiss of peace.